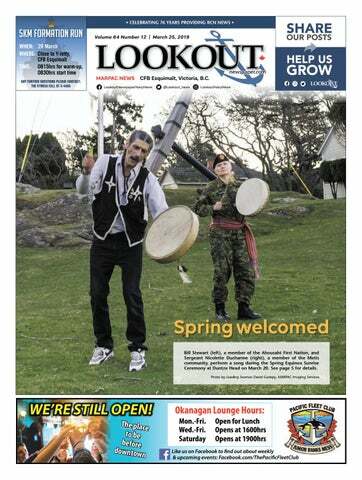 help us MARPAC NEWS CFB Esquimalt, Victoria, B.C. Only use blue and/or white. For more details check out our Brand Guidelines. have a job for you.” PCT vessels Orca, Caribou, Raven and Wolf will be staffed by fleet personnel and Venture students from the Fleet Navigating and Naval Warfare Officers courses needing the fundamental bridge skills training to prepare them for employment in operational ships. Each student is seeking the opportunity to advance their professional competencies. While in Port McNeill between March 29 and April 1, two vessels will take residents and community leaders to sea, showcasing interoperability with the Royal Canadian Air Force, who have tasked a Maritime Patrol Aircraft from CFB Comox, and the Canadian Coast Guard, who have tasked a Bell 429 helicopter. The remaining two Orca vessels will remain alongside, and open up for guided tours throughout March 30. The outreach effort and exercise will also involve 20 reservists from a Canadian Ranger Patrol Group. The Pacific Fleet Commander, Commodore Angus Topshee is also attending the community relations event, along with representatives from the Defence Aboriginal Advisory Group. Lastly, a three-person forward logistics site will be established in Port McNeill to support the exercise, and Canadian Armed Forces recruiting personnel, with a navy recruiting bus, will be present to give the community insight into the navy. The outreach effort will also involve a charitable donation by the Boomer’s Legacy Foundation, facilitated by LCdr Kennedy on behalf of Maritime Forces Pacific and the local detachment of the RCMP. They will distribute 70 knitted toques, 70 knitted dolls and two knitted blankets to a Port McNeill non-profit, the Sacred Wolf Friendship Centre in Port Hardy. MARPAC PA Office to sign-up for this event at 250-363-5789 or melissa.kia@forces.gc.ca. About Gurdeep Pandher Gurdeep Pandher is a Whitehorse-based artist and author. His works are meant to bring people from all backgrounds together to promote inclusivity and diversity. His dance videos have gone viral on many occasions, have also been published internationally, and are watched by millions from all over the world. He has been published by BBC News, CBC National, The Globe and Mail, CTV News, and many international art and media organizations. Governmental bodies including Canadian Embassies and High Commissions abroad, have also published his works to exhibit an ebullient side of Canadian multiculturalism. Published each Monday, under the authority of Capt(N) Jason Boyd, Base Commander. 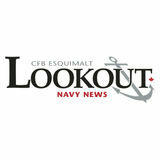 Le LOOKOUT est publié tous les lundi, sous l’égide du Capt(N) Jason Boyd, Commandant de la Base. military, LS Dana Kimoto, a member of the Operations Department, said, “I joined the navy almost eight years ago. I really had no idea what to expect as a woman in the military. I’d heard stories of how it was a boy’s club and how ‘boys will be boys’, but in my experience that hasn’t really been the case at all. I’ve found the military to be more respectful and equal than other jobs I’ve had. Being able to visit countries where women’s’ rights are not as advanced, and occasionally interacting with women in other navies, has made me appreciate the freedoms we have as woman in the Canadian military. Navy newcomer MCpl Amy Kingston was struck by the navy’s motto: “a sailor first.” “In all activities governing the operation of the ship, be it replenishment at sea, part ship hands or storing ship, all hands are on deck with the sole consideration of carrying out duties safely and efficiently. Gender, age, and all other demographic markers do not come into play when accomplishing these tasks. Experience and leadership are the sole criteria that decides who makes the requisite calls. There is an explicit regard and respect for all which makes serving in Regina a fulfilling and rewarding endeavour, regardless of whether one belongs to a demographic majority or minority.” In short, the common thread that runs through almost every conversation about being a woman in the navy is that while it is not always easy, it is never boring, and we continue to progress with integration in an organization where there is no gender-based wage gap, and everyone is offered equal opportunity for advancement. But perhaps, the greatest sign of how far we’ve come in the generation since women have been allowed to serve at sea, is hearing some male members of Regina remark on how few females there currently are onboard. Our presence at sea is noticed and is continuing to be a positive force in the Royal Canadian Navy today. The editor reserves the right to edit, abridge or reject copy or advertising to adhere to policy as outlined in PSP Policy Manual. Views and opinions expressed are not necessarily those of the Department of National Defence. Le Rédacteur se réserve le droit de modifier, de condenser ou de rejeter les articles, photographies, ou annonces plublicitaires pour adhérer Manuel des politiques des PSP. Les opinions et annonces exprimées dans le journal ne réflètent pas nécéssairement le point de vue du MDN. HMCS Regina’s female crew members pose for a photo to celebrate international womens day on the Pacific Ocean during Operation Projecton on March 10. Front row left to right: Leading Seaman Audrey Leroux, Sub-Lieutenant Morgan Chaffee-Goehr, Able Seaman Madison Walker, Master Corporal Victoria Rogers, Corporal Carly Forde, Master Seaman Jillian Deneau, Leading Seaman Jazmane Guy, Leading Seaman Valerie Courville, Lieutenant (Navy) Katrina May Giesbrecht, Lieutenant (Navy) Nicole Amanda Forbes, Corporal Chantale Robichaud, Ordinary Seaman Basic Valerie Bustros, and Able Seaman Naudeep Phagoora. Back row left to right: Leading Seaman Jefren Liu, Master Seaman Amie Savage, Petty Officer First Class Natalie Halldorson, Captain Melanie Jupp, Lieutenant (Navy) Danielle Chagnon, Master Corporal Amy Kingston, and Leading Seaman Jessica Armstrong. WHEN YOU REGISTER FOR THE NAVY RUN. Edūr socks! An $18 value, but free with your registration, plus a beautiful navy branded running shirt. Own a Single Family Home in the master planned community of Royal Bay – Yes, it is within your reach! modern interiors, tailored for maximum livability. We have carefully planned each residence to make the most of the stunning seaside setting just a short walk away. 92*%1-0=H82)77ę RUN WITH THE MILITARY AND SHOW YOUR SUPPORT! The Navy Run - 10K, 5K, Pole Walking and Kids Fun Run is an inclusive community event. Involve the children and discover a fitter family lifestyle. Do it because you can! game convinced everyone the teams should be switched up. Classic to a road/jetty hockey draft, everyone threw one shoe into a pile in the middle of the court. The mound of untied, peculiar-smelling footwear was then divided in half. With shoes back on, team strategies were crafted in quiet, closed huddles. Team Jerseys and Team Plain Shirts had a much closer game, possibly proving the effectiveness of the time-honoured and tested method of the road/jetty hockey draft. In the end, the final score was 2-1 for Team Plain Shirts. Ball hockey on the jetty was a great way to have the two ships’ companies bond with a little Canuck flare. The cohesion between the two, strengthened through this event, will prove irreplaceable as Regina and Asterix sail onward toward their roles in Operations Projection and Artemis. Members of the HMCS Regina and NRU Asterix’s crews play a game of ball hockey during some down time at Naval Base Guam during Operation Photos by Corporal Stuart Evans, Borden Imaging Services Projecton on March 7. Lt(N) Greg Morrow provides casualty clearing training onboard HMCS Kingston while at sea during Operation Projection West Africa. selected to join HMCS Kingston to deploy to West Africa. “Medical officers don’t get to sail very often,” he explained, “so I jumped at the opportunity. That said, I knew had my work cut out figuring out life in a ship.” On his return from West Africa, Lt(N) Morrow will serve as a General Duty Medical Officer at Canadian Forces Health Services (Atlantic), providing care to personnel at CFB Halifax and the surrounding area. The Canadian Armed Forces are currently hiring medical officers, and more information can be found at https://www.canada.ca/ en/department-national-defence/ services/caf-jobs.html. Top left: The Commanding Officers of HMC Ships Shawinigan and Kingston present donated school supplies to the director of L’Espace de Fraternité in Lomé, Togo. Bottom left: LCdr Jeremy Samson, Commanding Officer of HMCS Kingston, is interviewed by Togolese military journalists shortly after arriving in Lomé. HMCS Kingston Navigating Officer, Lt(N) Graham Austin discusses search-and-rescue strategies with Togolese military and government personnel on March 7.
or people in distress. “My favourite part of international deployments is meeting new people,” said Lt(N) Steve Bartholomew, who organized the visit on behalf of the ship. “Today, we had a great opportunity to share some of our practices with the Togolese SAR [search and rescue] community, and to learn how they do things in return. Overall, it was a great event.” Spirits were high as the crews prepared to leave after a hectic and rewarding few days in Lomé. Their collective focus already shifting to their next set of regional engagements, each sailor was now part of the history of Canada’s warm and ever-strengthening relationship with Togo. spouses equal and fair access to employment opportunities within their organizations. Growing steadily, the newly minted Military Spousal Employment Network has more than 1,200 users since it launched in the fall. The Network is a self-directed online resource with access to job postings, tools, resources, and events such as training sessions and virtual and in-person career fairs. Military spouses can register for the Military Spousal Employment Network at msen.vfairs.com and the virtual career fair at http://bit. ly/Mar27VirtualCareerFair. Joe Oâ&#x20AC;&#x2122;Rourke, Vice President and General Manager of Seaspan Victoria Shipyards, presents Military Family Resource Centre (MFRC) Executive Director Jackie CarlĂŠ with a donation of $8,000. The donation, received on Thursday March 21 at the Signal Hill MFRC, is going to support services for military families at CFB Esquimalt. SETTLEMENT NOTICE Were you affected by anti-LGBT policies while serving in the Canadian Armed Forces, the RCMP or the Federal Public Service between December 1, 1955 and June 20, 1996? Top inset: Master Corporal Robert Basso (left) calls out instructions while providing first aid to simulated casualty Lieutenant Craig Bellamy. Inset: Sub-Lieutenant Mackenzie Labrecque practices traditional navigation with a sextant. Leading Seaman Alexis Côté-Lapointe conducts repairs on the ship’s anchor chain. Leading Seaman Robert Anderson (left) and Able Seaman Thomas Quijote (right) release 1,500 feet of the ship’s sonar tail. 5KM FORMATION RUN WHEN 29 March WHERE Close to Y-Jetty, CFB Esquimalt 0815hrs for warm-up, TIME 0830hrs start time PLEASE BE AWARE RUNNERS WILL NEED TO BRING THEIR MILITARY/DND IDENTIFICATION TO THE FORMATION RUN AND HAVE IT ON THEM DURING THE RUN FOR RE-ENTRY INTO THE GATE. WALK OR RUN | GET FIT | BE HEALTHY COME OUT AND PARTICIPATE – everyone welcome! HMCS Ottawa aids USN in submarine course Peter Mallett Staff Writer HMCS Ottawa has returned to Esquimalt after successful completion of a training exercise involving torpedo fire with vessels of the United States Navy (USN), and support to the Canadian Navy’s Operation Projection. The Halifax-class frigate and its crew of 220 completed a month-long deployment on March 4 that included participation in a USN Submarine Commander’s Course (SCC), Feb. 20 to 22, off the coast of Hawaii. MH60R Seahawk helicopters and a P3 Orion fixed wing, anti-submarine surveillance aircraft. LCdr Bergmann rated his crew’s performance as “excellent” and commended them for overcoming the challenges faced in an anti-submarine warfare environment. While deployed, the ship’s company hosted a video game tournament in its hangar to support the Perley and Rideau Veterans’ Health Centre, the ship’s namesake city. Together with a 50/50 draw, $2,000 of support was raised for the centre. HMCS Regina, Asterix, and HMCS Ottawa enroute to Hawaii. Commodore Angus Topshee and his staff pose on board HMCS Ottawa as the ship enters Pearl Harbor. 24-hour medical services, psychiatric assessment, group and 1-on-1 psychotherapy, EMDR, hypnotherapy, and more. Inpatient services only. Cadet Richard stands by to jigger the mainsail peak halyard one last time. Cadet Renate has a look at her sail training handbook. A cadet trainee waves goodbye to her instructors after returning from her five-day journey aboard Pacific Swift, March 11 to 15. Bosun Brock directs cadets Cassandra and Hunter as they prepare to come alongside in Victoria Harbour on the deck of S.A.L.T.S. schooner Pacific Swift. 40TH ANNIVERSARY OF 268 RCSCC Bras D’Or will take place on the weekend of May 24 to 26 in Quispamsis/ Rothesay, NB. The events will be a Meet and Greet on Friday May 24 at Branch 58 Legion, Annual Cadet Review and Dinner, Saturday May 25, BBQ at Meehan Cove Beach, Sun May 26. For more information email eisanb@nb,sympatcio.ca or call Brian at 506 849-4146. CONDO FOR RENT RENOVATED 2 BEDROOM CORNER APARTMENT for April 1st - Renting at $1470/mo. on 795 Fairview Rd. Esquimalt. Cat is okay with pet deposit. For viewing phone 250 382-9099, Apt Managers: Anna and Lloyd. RESCUE CATS AND KITTENS, as well as specialneeds / senior rescue kitties, looking for permanent and foster homes. Please call 250-881-1112 if you can help. All veterans, military, RCMP, and their families. Tous les vétérans, les militaires, les membres de la GRC et leur famille.